The mortar is AOK to go so today it went. Nearly at the top inside, vermiculite in between the two layers. Three more courses to do tomorrow and then it’s onto the next bit. I’m shattered, had a couple of late nights at various meetings this week and a head too full to sleep very well. So short and probably not that sweet tonight. Bye. This entry was posted in cement, kiln bricks, kiln building. Bookmark the permalink. Thanks Dave, it's really not that neat in the brick but of you want to think I'm a fabulous brick layer then please do continue. 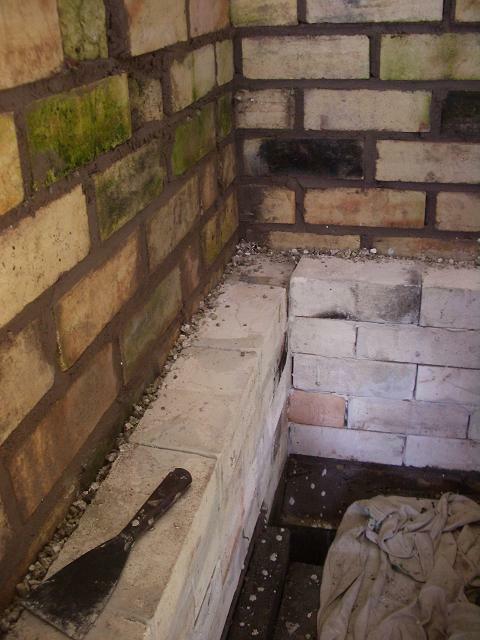 looks like some good hard work H.. well done..
Only in Britain are the brick so green and moldy…beautiful! Studio Apartment FOR SALE. POA. Great views. Mega central heating! !